This is a staple dish of mine that I make at least once a month. Only one pan is required here so clean up is super easy, and if you are eating alone, the fajita mixture reheats beautifully. There are only a few fresh ingredients that you will need but chances are, you will have the majority in your fridge/pantry already. 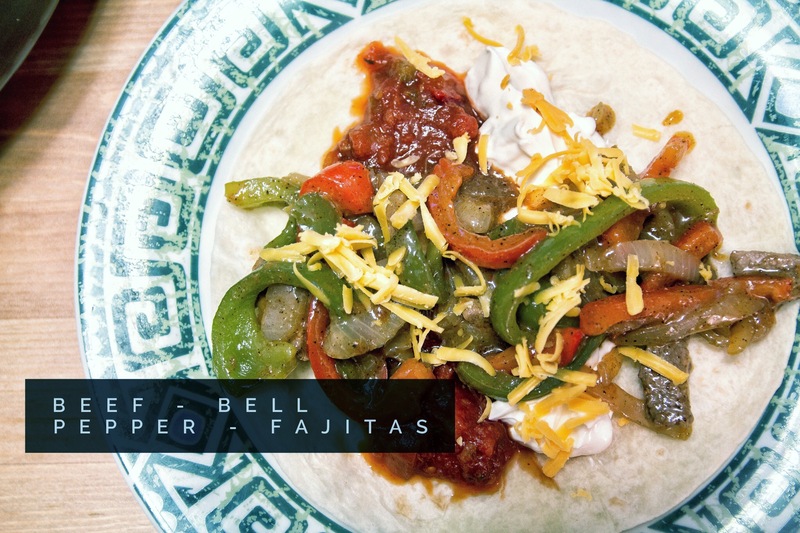 I have tried and tested the perfect fajita spice mixture that tastes better than the packaged kind, has far less MSG, and used up spices I already had in my pantry- told you this was easy! The result is pure perfection in every bite: juicy, saucy, flavourful flank steak fajitas. The recipe is provided below and I would love to hear how they turn out if you make them! Preheat oven to 350 degrees. Cook tortillas according to package. Combine all spices in a small bowl. Set aside. Heat olive oil in a large pan on medium high heat. Toss in steak and cook until mostly browned on both sides. Add in red pepper, green pepper and onion. Stir. Sprinkle fajita spice mixture on top. Stir until mixture is incorporated with the meat and vegetables. Cover the pan with the lid and cook for about 3-4 minutes. Slowly begin to add water in, 1/4 cup at a time, and continuing to stir. When all water is added, stir every 1-2 minutes until the peppers and onion have ‘shlumped’ down considerably and are well sauteed and limp. It should look like the photo above. Test the fajita sauce. If the mixture is too strong, add water 1/4 cup at a time and reduce until mixture has thickened. Remove from heat when mixture has finished cooking, and sauce has reached your desired potency. Spoon salsa, sour cream, and a sprinkling of cheese onto tortilla. Add mixture. Roll up and enjoy! Previous Post My ‘One Lovely Blog Award’ Nomination!